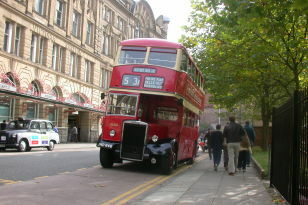 As well as housing numerous vehicles, the museum holds a large archive, revealing the faces and places associated with Manchester’s public transport for over a hundred years. As well as many books and periodicals on the subject of local transport history, the archive has publicity material from manufacturers of vehicles, ticketing and other equipment, and from operators for holidays, tours and excursions, supported by posters for such activities. There are many hundreds of maps, plans and drawings, for routes, buildings, chassis and bodywork, and “deposited plans” for proposed tramways. There are tickets from all the local operators, and other ephemera such as handbills, leaflets, certificates, trade union membership cards, and so on, and around 70 volumes of newspaper clippings compiled by various local operators. Several thousand photographs, transparencies and glass plate negatives, film and videos can be seen, taken by official photographers, manufacturers or interested amateurs, depicting buses, trams, trolleybuses, personnel, buildings, street scenes or events. The Archives is also of course the repository for the Society’s own records and history – the Board minutes, accounts, the Journal, posters, leaflets, tickets for events, and so on – the “Collective memory” for the Society and Museum. 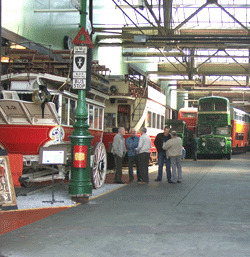 The Museum of Transport is open every Wednesday, Saturday, Sunday and bank holiday (and every day in August 2013) from 10am until 4.30pm. Adults £4.00, students / over 60s £2.00, accompanied children under 16 visit free. Take a trip back in time with one of Britain’s biggest collections of restored buses, coaches and trams. From a Victorian horse drawn bus to the prototype Metrolink tram, see and sit in fascinating vehicles that took Greater Manchester folk to work, shops and outings to the coast and countryside.